What is promotion with coupon timer ? A promotion with coupon timer is an idea designed to convert your incoming traffic to your customers. If you are planning to have a promotion across your store, this extension is designed to improve your sales. It provides you with the 2 ways to run a coupon promotion across the store. Learn the 2 ways to improve sales with coupon promotion? Suppose you visit any online store. You add to cart a product & move towards the checkout. Now suddenly you are given an offer that this product will be 15% less for only one hour. Will this have an impact on your decision making of buying the product? Around 90% customers will choose to buy the products within one hour. What we are doing is: We are playing with the human mind an behavior to make the deal happen. This is our first way to promote the coupons. the offer is shown to the customer just after the product is added to cart. The second way to promote the coupons is more generic and for all the visitors. 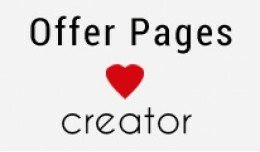 Visitors are shown the offer when they visit the website. They can click the offer to apply and it will be added to their cart. 1) We provide analytics/number about how many traffic has clicked the coupon. 2) Also analytics about the sales done with coupon. The number of visitors to customers. 3) Option to select own colors as per your store theme. 4) Option to show the promotion only after login. 5) Option to set time for which promotion will be active. 6) Works with all custom themes. 9) Option to add your messages for promotion. 10) Designed to work with smartphones as well. 11) No core files changed. 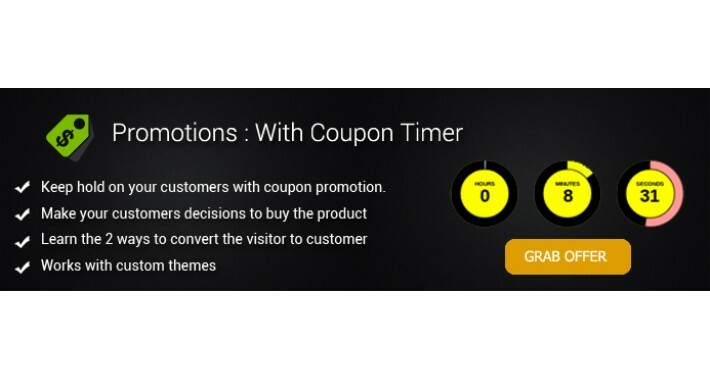 Short Summary A promotion with coupon timer is an idea designed to convert your incoming traffic to your customers. If you are planning to have a promotion across your store, this extension is designed to improve your sales. It provides you with the 2 ways to run a coupon promotion across the store.